featuring aerial imagery and 3D models of the country’s most legendary stadiums. Fly to Fenway in Boston, soar over Chicago’s Wrigley Field and check out San Francisco Bay and AT&T Park, all from a bird’s eye view. What a way to take a virtual journey with your team as they travel across the country! For the lucky fans that get to attend their favorite team’s games in person, we’ve put together a few tips to make the most of each match-up. Batter up! Our first tip aims to keep you warm and dry on game day. Nothing ruins a day at the park like unexpected weather. Make sure you dress appropriately for the game and don’t miss a minute of the action. On Google Maps, just select the weather layer from the drop down in the upper right hand corner of the map and zoom to specific cities to see the current and expected conditions. The weather layer in Google Maps shows that it’s going to be a pretty chilly day at AT&T Park. Now that you’ve got your jacket packed, where to go pre-game for a light snack? 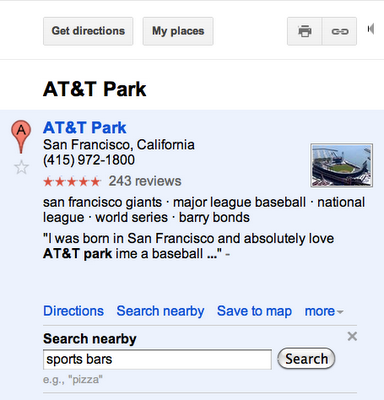 Enter a ballpark or stadium name in Google Maps and use the “Search Nearby” feature to find sports bars, hotels, public transportation stops and more in the same neighborhood. If you are already at the ballpark, use the same feature on Google Maps for mobile and get directions on the go. Are you planning on meeting friends at the game? 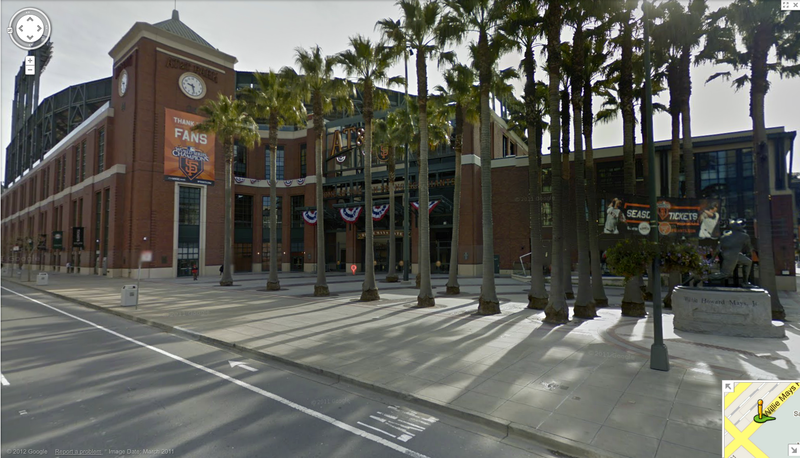 Scope out the area around the ballpark with Street View in Google Maps to pick a spot to meet up before finding your seats (and maybe a couple of hot dogs along the way). For many fans, this might be the year to do that baseball road trip you’ve always talked about. Create a Custom Map with your itinerary and mark the surrounding restaurants or local sites you visit along the way. Share your map with friends and family and add text, videos and photos to create an archive of your travels to enjoy during the off-season and for years to come. We hope you find these tips useful on opening day and beyond. Best of luck to each and every team. Play ball! 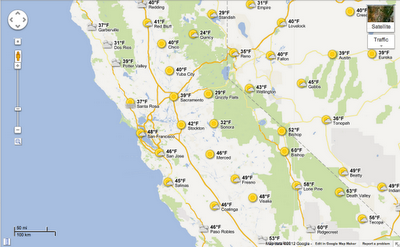 Spring is finally here and with it, the beginning of the 2012 baseball season! For die hard fans, this means the beginning of another fabulous year of Cracker Jacks and days at the ballpark. To celebrate the start of the 2012 season of America’s pastime, we’ve created a special Google Earth video featuring aerial imagery and 3D models of the country’s most legendary stadiums. Fly to Fenway in Boston, soar over Chicago’s Wrigley Field and check out San Francisco Bay and AT&T Park, all from a bird’s eye view. What a way to take a virtual journey with your team as they travel across the country!